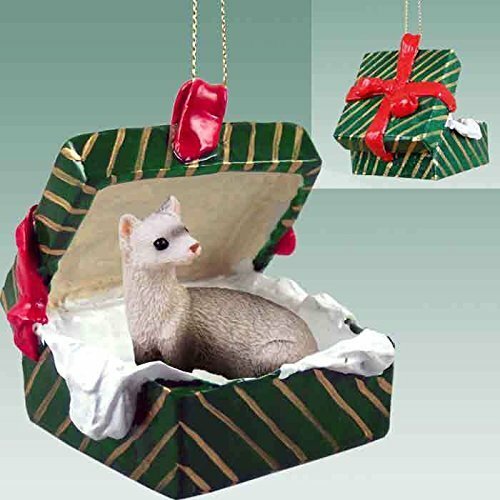 Deck your halls and trim your tree with this sweet and colorful Ferret Gift Box Christmas Ornament. Our Ferret Gift Box Christmas Ornaments are crafted from fine quality stone resin and feature a beautiful full color figurine. All of our Christmas ornaments are crafted for a lifetime of memories and make wonderful gifts, and these beautiful Ferret Gift Box Christmas Ornament are no exception. Gift Box has a flat bottom so that it may be placed on a desk or shelf. Delicately Hand Painted on Stone Resin. Mounted with a gold tone cord. Approximately 2" tall x 1.625" deep x 1.625" wide.